Last fall, I sat under our oak tree with a group of 3 to 6 year olds that were enrolled in one of my nature classes. It was the middle of fall, the leaves had turned into warm shades of yellow, red and orange. That day, I began class by telling the children a story about a squirrel that was busy gathering nuts and getting ready for winter. A 4-year old girl from that class was back for the spring session. Another child had found a chewed open walnut shell. Almost immediately, the girl began retelling the story about the squirrel and remembered every detail. The same class a few years ago was a bit different. I read a book about a squirrel, shared facts about what squirrels do in the winter, showed the children real nuts and played a nut gathering game. It was hands-on, the children were having fun while learned a thing or two. But how much did the children remember 1 month or even 1 year later? I was convinced that these hands-on activities were the best way for children to learn. What I didn’t realize back then was that I was missing a crucial piece. A piece that laid the foundation for learning AND brought a sense of wonder and magic to it. Storytelling was that missing piece. Sure, I read a lot of books with children. But storytelling has a completely different effect on our minds. Instead of simply absorbing the words and the illustrations, a child has to paint her own pictures based on the rich language of a told story. A brain lights up like 4th of July fireworks when a child uses their imagination. Compare that to memorizing facts which is more like a single firefly on a warm summer evening. It becomes crystal clear why storytelling is one of the most powerful teaching tools, right? From your responses to the 5 core elements of childhood that I have shared with you, I know that you get this. You see the value stories have and you want to fill your children’s lives with stories that spark their imagination and fuel their creativity. Many of you feel like you are not good at storytelling. Some of you mentioned that they thought school erased all imagination they once had as a child. Sound familiar? I completely understand. I never thought I had the gift to tell stories. I was creative in other ways but storytelling wasn’t one of my virtues. Heck, I didn’t even think I was great at reading books. But here is the thing…when you are working with children, reading books is not an option. You do it. Every. Single. Day. And you know what happens when you do something every day? You guessed it….You get good at it. The same applies to storytelling. I was very hesitant to try storytelling. I wanted to do it so badly but feared that I would keep forgetting the lines, stumble over my own words and the kids would just walk off. I decided to start small. My first story was ultra-short and only 5 or 6 sentences long. It was about a fairy because my daughter absolutely adores fairies. I figured she wouldn’t be too critical as long as there were fairies. To my suprise, my daughter LOVED it. That was the moment I realized that storytelling wasn’t as hard as I made it out to be. I didn’t need to be an expert. I only needed to be good enough. From that day on, I told stories almost every day. I searched for stories online. I bought the book “Tell me a Story”, a lovely collection of Waldorf Stories. The stories were a bit too long and advanced for my own children and the children in my classes, but they served as wonderful inspiration. I began to write my own stories for my classes and combined them with hands-on activities that allowed the children to tinker and create. It was a perfect fit. The children were drawn to this new approach and rhythm. And I found sharing the stories more enjoyable than reading from a book. I was officially hooked on storytelling. And I will be honest with you, I am still not the best storyteller. But I’m good enough. Seeing that spark in the children’s eyes as they listen intently is enough for me to keep going. We all have our strengths and if you think storytelling isn’t one of yours (like I did), I have something for you today. Want to find out how to effortlessly weave stories into your child’s life? I have been thinking about the best way to do this. A detailed step-by-step guide about how to learn the art of storytelling? A video where I share some of my favorite stories? Nothing felt quite right…until one evening, when it hit me. I learned to tell stories by telling stories. Simple as that. I could give you all the tools, tips and tricks to become good at storytelling but it’s not going to work if you don’t actually end up telling stories. So, today I am super excited to share with you the most practical and easy “tool” to get you started. 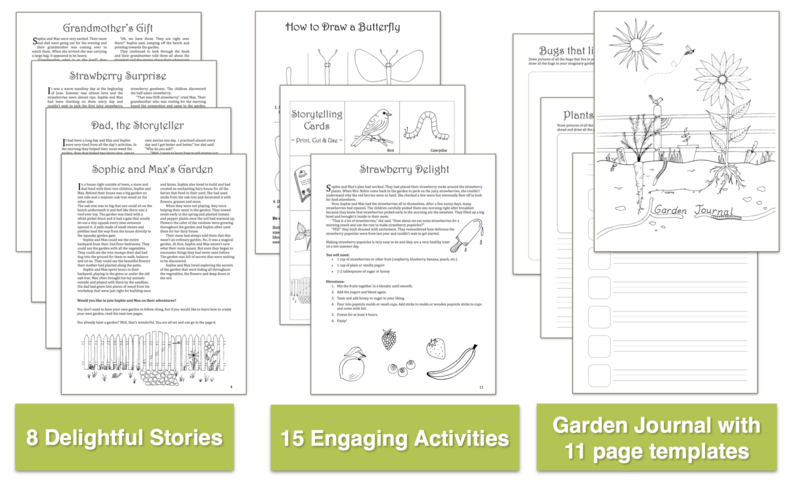 A summer-themed collection of short stories AND hands-on activities to go along with each story. You’ll have everything you need to turn your child’s summer into a delightful adventure (and get good at storytelling). No need to make up your own stories at first. Read the stories. And then tell the stories once you get the hang of it.